GALION — It took less than a day to tear down the Duchess Shoppe of the Englefield Oil Duke station on the corner of Harding Way West and Portland Way South. Construction workers and their vehicles made quick work of the demo project. The company is constructing a new store and pump canopy that will sit on a larger parcel of land than the previous location to allow more parking and easier access to motorists. 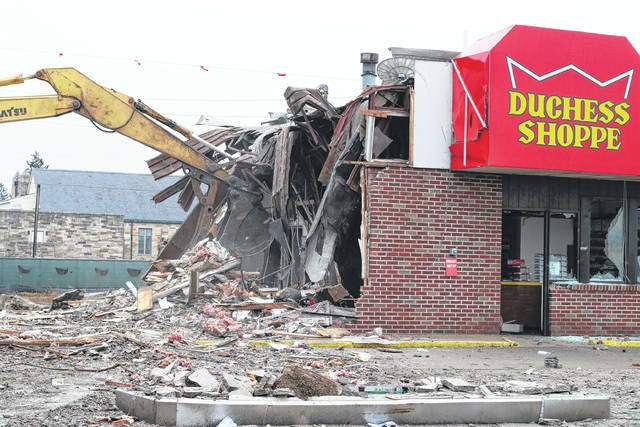 Erin Miller | Galion Inquirer It took less than a day to tear down the Duchess Shoppe of the Englefield Oil Duke station on the corner of Harding Way West and Portland Way South. Construction workers and their vehicles made quick work of the demo project. The company is constructing a new store and pump canopy that will sit on a larger parcel of land than the previous location to allow more parking and easier access to motorists. https://www.galioninquirer.com/wp-content/uploads/sites/38/2018/02/web1_IMG_0426.jpgErin Miller | Galion Inquirer It took less than a day to tear down the Duchess Shoppe of the Englefield Oil Duke station on the corner of Harding Way West and Portland Way South. Construction workers and their vehicles made quick work of the demo project. The company is constructing a new store and pump canopy that will sit on a larger parcel of land than the previous location to allow more parking and easier access to motorists.